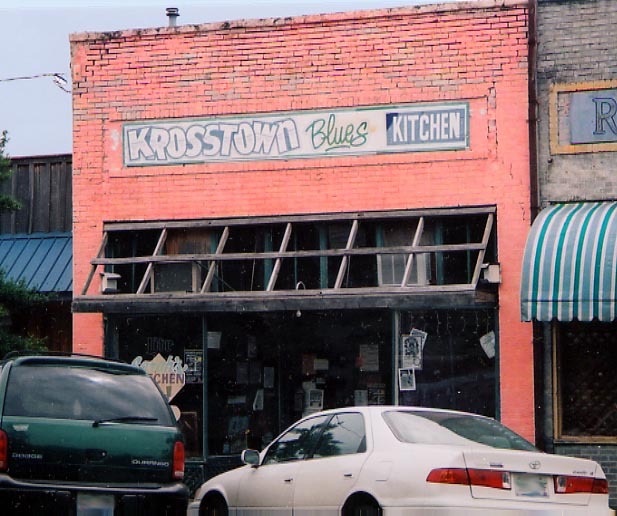 Sarah’s Kitchen (KrosstownBlues) in Mississippi, was and is rightly hailed as a beacon of Clarksdale’s blues scene and culture. Here’s a place where you can kick back and listen to some of the meanest delta blues you’re ever likely to hear played live in such intimate surroundings, and the food’s not too bad either. In fact, in keeping with the joint’s traditions, you’ll discover some of the best ‘home-cookin” you’re likely to bump in to any where in the state. The original and legendary owner, Mizz Sarah, who hosted the modern-day spirit of Delta blues for locals and tourists alike, may have passed on, but her daughter has risen to the challenge with as much love and spirit as her mother poured into the place, so the family tradition carries on. At a recent JukeJoint Festival, my old blues friend, Arnold, who has more than a passing acquaintance with the Sarah and her joint, fell in with some of the other regs and they ended up seeing in the dawn, listening to blues and swapping stories about some the characters and exploits that the place has hosted over the years, like how Sarah fed people regardless of their ability to pay and what an awesome cook she was. Arnold was also pleased to report that the spirit that Sarah instilled is still alive and fully present – as if the ghost of Sarah herself was bustling round the kitchen, shaking the pots and pans. If you’re into delta blues, and find yourself anywhere near Clarksdale, even if you have to drive a hundred miles out of your way, don’t cheat yourself out of a visit to this living piece of genuine American culture. Oh, and by the way, the fried catfish fillet southern-style is a must if you’re doing dinner. And don’t forget – they serve breakfast as well.